In addition to performing the many tasks required to run a successful outdoor clothing company, Patagonia employees are helping to create a new national park in South America. To date, about 50 have traveled in groups of six to Chilean Patagonia - the company's namesake - to spend three weeks digging out fence posts, rolling up wire and removing nonnative plants. The subject of this ambitious transformation process is Estancia Valle Chacabuco. The nearest town of any size is Cochrane, population 4,000. From Patagonia headquarters in Ventura, California, it's a 16-hour flight to Balmaceda, followed by a bumpy eight-hour truck ride down a dusty road that leads to one of the world's last great wilderness areas. Like many other large landholdings in Patagonia, this estancia was used to raise sheep and cattle. It's a business that takes a heavy toll on land and wildlife, with erosion, logging, road-building, fire and the introduction of invasive plants. But in 2004, former Patagonia CEO, Kristine Tompkins, bought the estancia through the nonprofit foundation, Conservación Patagonica, with the aim of restoring and permanently protecting it. Along with the grassland that has supported large herds of livestock, the estancia's 173,000 acres include magnificent steppe, southern beech forests and high peaks. Rivers, wetlands and a large lake on its southern boundary also make up this highly unusual landscape, which is home to more than a hundred fauna species, including nearly extinct huemul deer, guanacos, and the four-eyed Patagonian frog. Restoring the land meant removing the 20,000 sheep, 3,000 head of cattle and 340 or so miles of fence that contained them. Workers are building trails, restoring grasslands and have built a visitor's center and other essential infrastructure. The park will soon be powered with energy derived from renewable sources. The former estancia now separates the Jeinimeni and Tamango Chilean National reserves. When the park is complete, it will join those wild lands to provide nearly 650,000 protected and connected acres for wildlife, and a world-class wilderness for posterity. Patagonia's commitment to this project is open-ended. Though maybe not the most economical way to remediate a remote landscape in a country with low labor costs, the project serves several functions, including connecting employees firsthand with the wildness that inspired the Patagonia brand. "We talk a lot about what our logo depicts: vast landscapes, wild, varied weather, harmony with wilderness," said Lu Setnicka, director of human resources. "To be able to be there and get a sense of that spirit is invaluable in communicating our brand heritage and identity." The project also has given employees the opportunity to experience what it takes to restore a degraded landscape and afforded them time away with colleagues from all parts of the company, which creates a greater sense of camaraderie amid several weeks of work, play and travel. "We have such a great group of people who work here. It was tremendous learning more about their wonderful personalities, quirky attributes and unique spirits," said Lu, who went on one of the early trips. "Through this experience, we'll probably be joined at the hip for years." Become a partner in Conservación Patagonica. 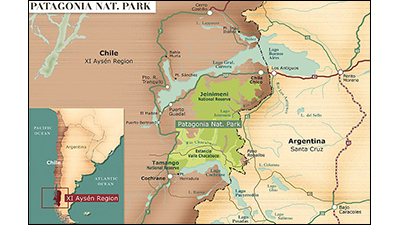 See a map of the future Patagonia National Park.